Welcome and thanks for stopping by! 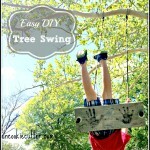 I’m here to share details on our new, easy tree swing! 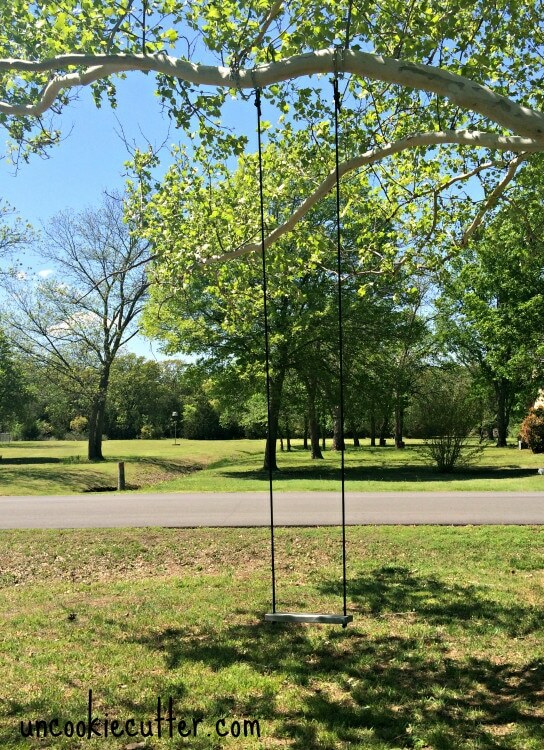 At our old house, we had a tree swing that we loved. We loved it so much that my friend incorported it into the family pic he drew for us. See it set up in our new home here. And, our Realtor had in drawn into this lovely pic she got us as a gift. Thanks Jo! So, I promised the kids we would have one here in Oklahoma when we got here. I finally followed through on my promise. 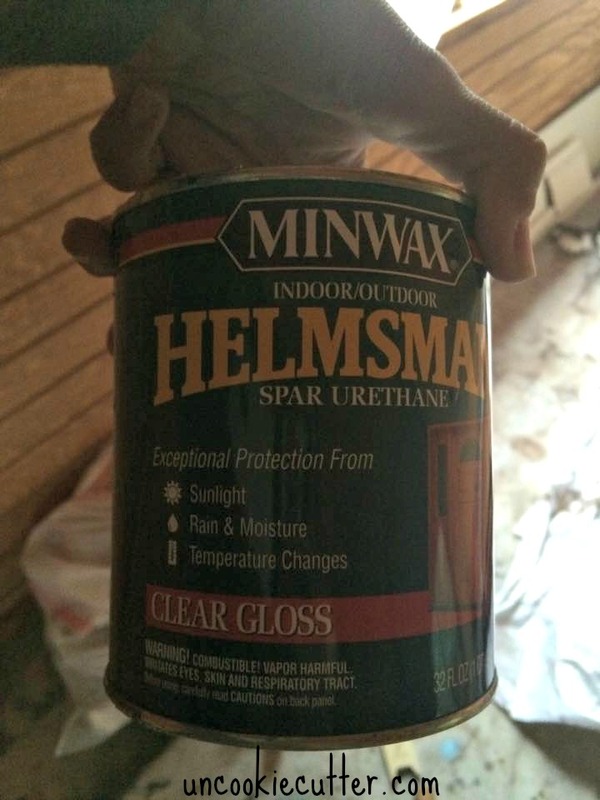 The only thing that took any time was waiting for the stains to dry. I was such an easy project and the kids love it! I found this tutorial online and pretty much followed it, just adding a few personal touches. This is a great starter project, if you are looking to start a little woodworking with something easy. You can cut your wood, like in the tutorial, or buy a piece of wood at Lowes or Home Depot and just give them the measurements and they will cut it for you. Make a couple cuts, drill a couple of holes and stain the wood. Easy Peasy! The rope is easy to cut and when I bought the chain, I gave the nice man at Lowes my measurements and he cut it for me. My saw won’t cut metal. And, I added this fun touch, which the kids think is awesome. When I hung it, I had the hand prints face the ground, so it’s not so obvious. Anyway, then I just followed the steps in the tutorial and viola! It didn’t take long for the standing on it to start :). 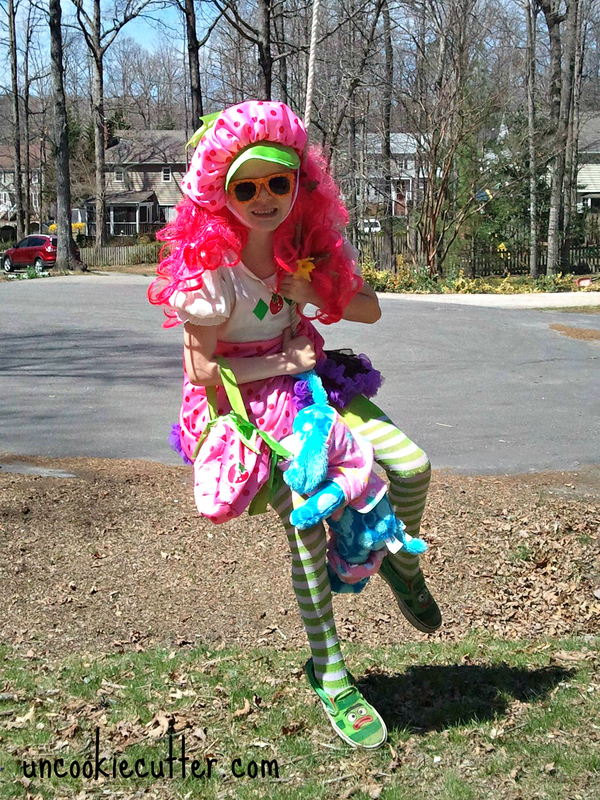 The neighborhood kids got a kick out of it too. 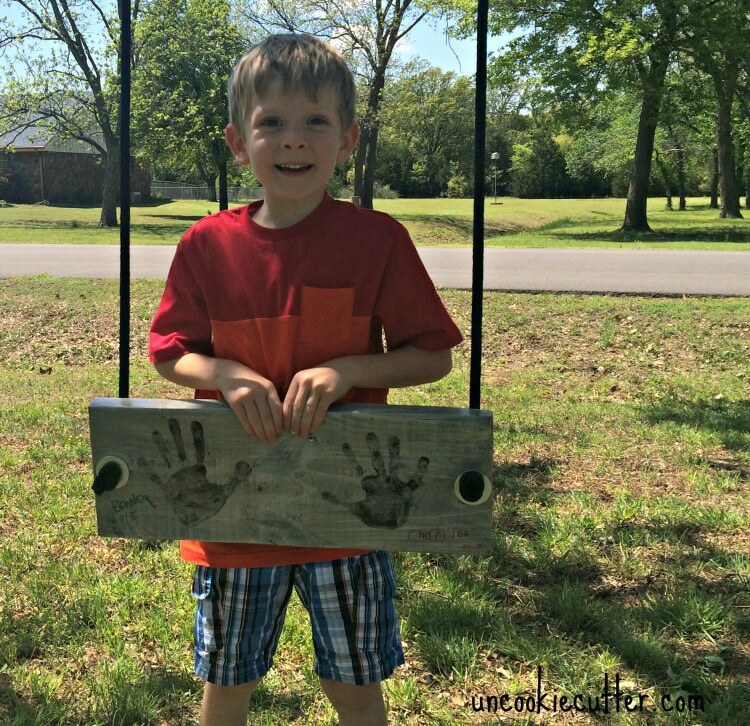 My boy was so happy when he noticed the hand prints, which he had forgotten about during the excitement of trying to swing. Then he wanted me to get a pic of the hand prints mid-swing. I took this aerial shot from atop the ladder, :). 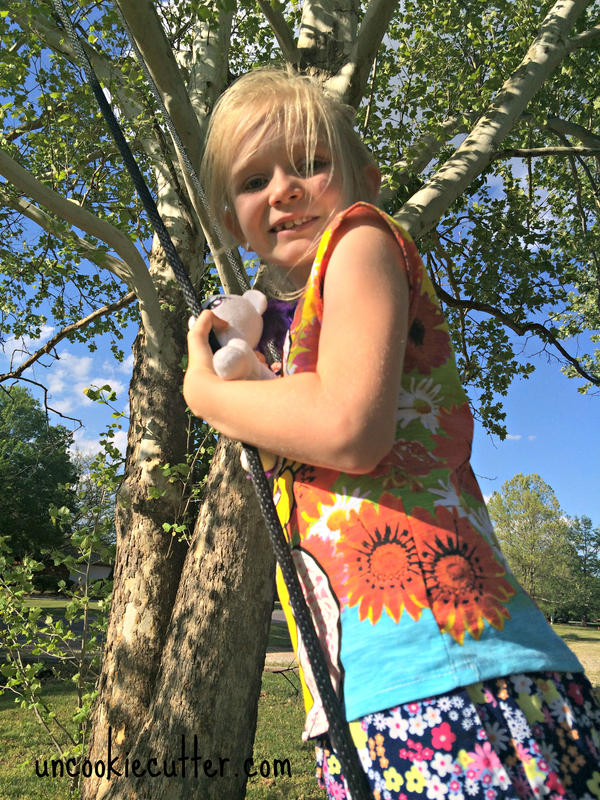 Make sure you get a rope that is not going to give little kids splinters. I first thought I was going to go more rustic, with a brown rope, but our one little hardware store didn’t have any nice looking twisted brown rope that was safe, so I opted for this black. 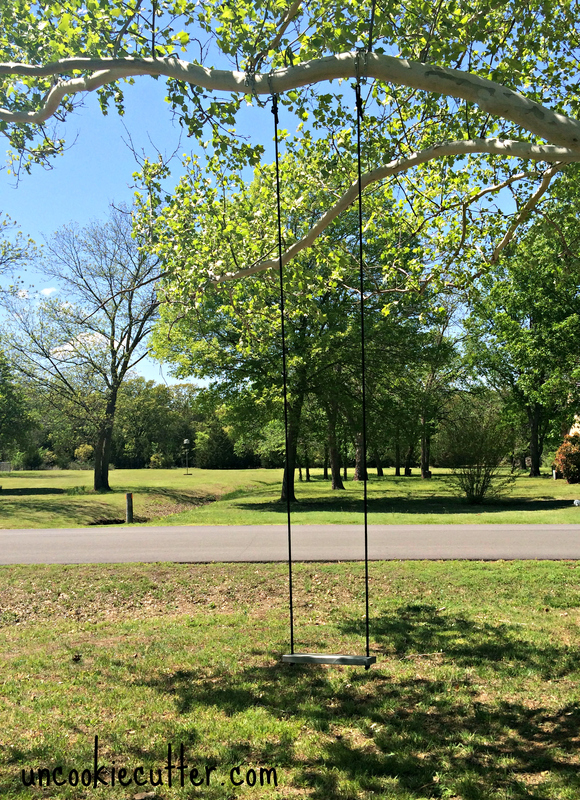 Then I decided to go gray with the swing, which worked perfectly because I had some gray stain lying around. And because the tutorial said I HAD to, I took a trip before the kids got home. 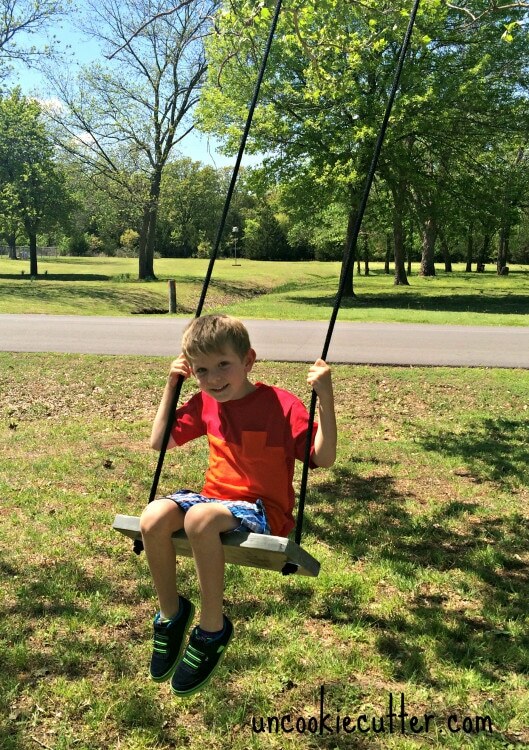 Thanks for stopping by, let me know if you have any questions and get building your own tree swing! 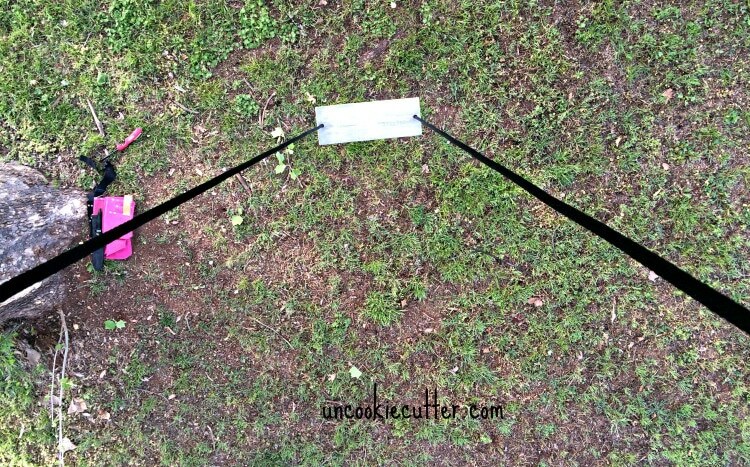 Again, head on over to HGTV and find the tutorial HERE. 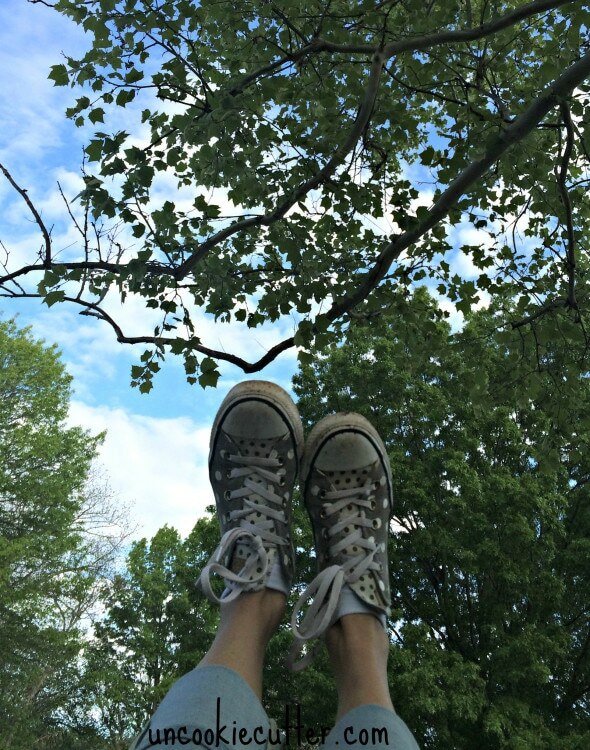 This swing looks perfect! I love it :). Thanks Ali! I’m glad you came by to take a look! Haha, thanks Kim! They are loving it! Oh, I so wish we had the trees for this! But, pine trees and swings don’t mix well! Love it! Oh no! Thanks for stopping by! 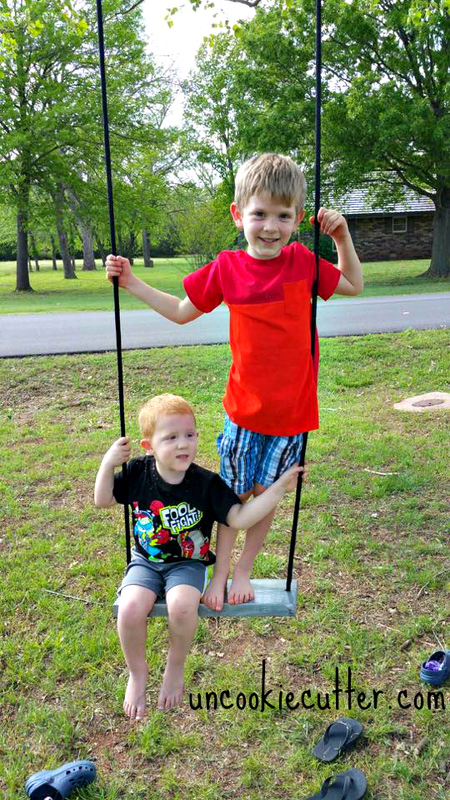 We are currently house hunting and when the right house is found, my kids are all about a swing in the yard! They really do use it all the time, it’s so fun! Thanks for stopping by! 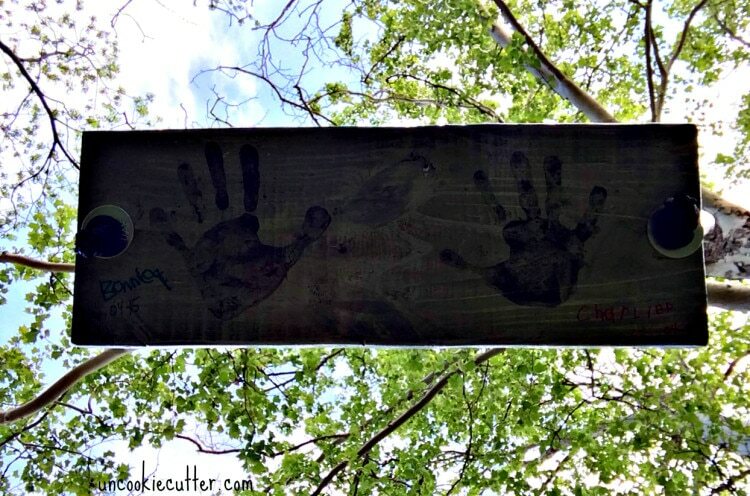 Love the handprint idea! 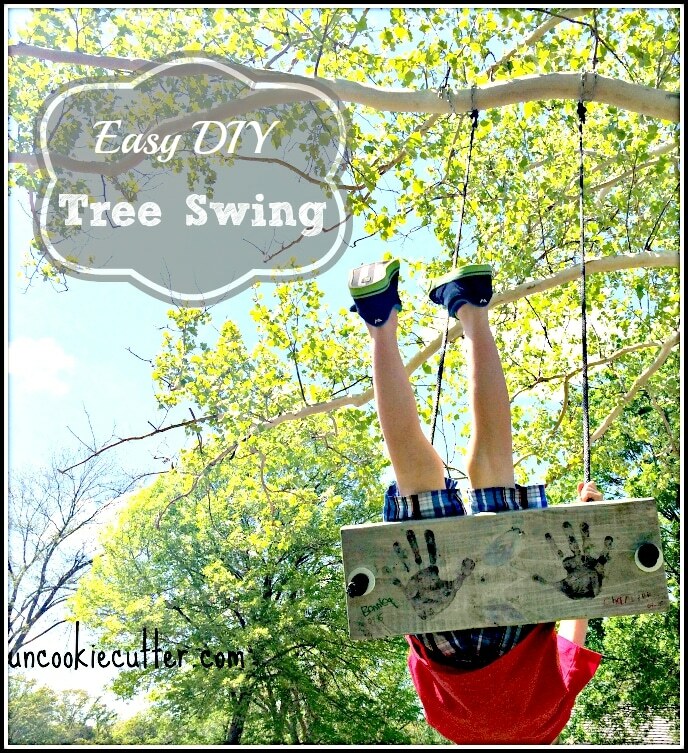 My kids are about to knock over our wooden swingset as they grow, we might have to find a tree instead! So much cheaper! We had a wooden one at our old house, but my kids are almost 6 and 8 and just seems like the ones for their age group are way overpriced. So we are trying to come up with ways to get the fun for cheaper. Thanks for coming by! Thank you! It was super easy, if I didn’t have to wait for stain and poly to dry, it would have taken less than an hour to do. Good luck and thanks for stopping by! You could totally make this! So easy. You have a blog too! Headed over now, thanks for coming by! Cute and adorable. I can imagine how much fun it would have been. Thanks and thanks so much for stopping by! I love this! 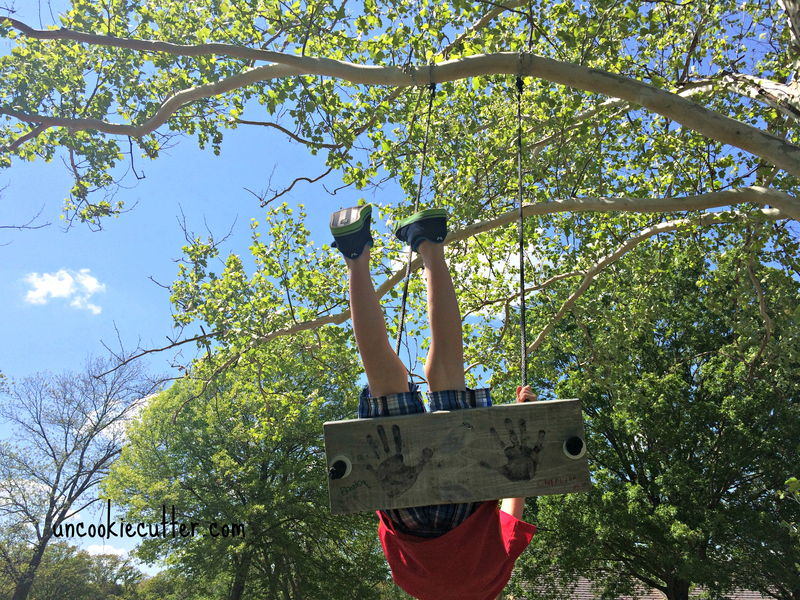 My kids want a tree swing and a tree house so bad. We have a huge play structure in our backyard, but that is not enough. We have big tree’s in our backyard, but none with good strong branches to hang a swing on. I would put my kid’s hand prints on everything if I could. I love doing that so much! Thanks Emily! 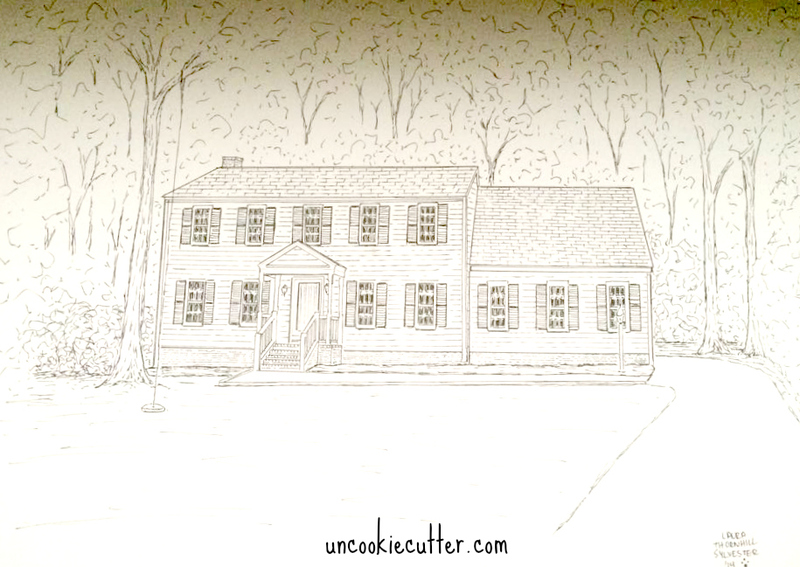 We had a huge structure at our last house, but when we moved I just didn’t want to shell out the money again, since they are almost 6 and 8. So, I made this and promised a zipline, haha! But it did save us some money :). Thanks for being so kind to generally share this information. Why haven’t I ever seen this swing!! 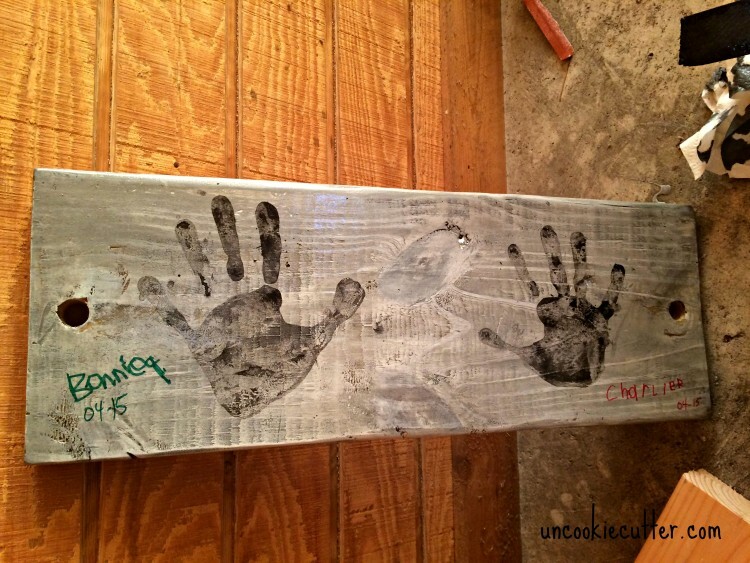 I LOVE it…..especially the handprints!! What a great idea for grandparents gift!!! That IS a great idea for a grandparent gift! See, you’re a thinker ;).